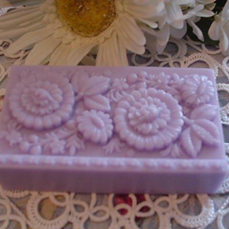 This beautiful loofah goats milk soap is made with the finest, all natural ingredients including goats milk, loofah, commercial grade fragrance oil and food grade soap colorant. These soaps were created to cleanse, moisturize, exfoliate and condition which results in a wonderfully refreshing and rejuvenating experience! Each bar weighs approximately 5 oz and is 3 1/2" across and 1 1/2" high. It features a floral bouquet design that includes rose buds and violets. 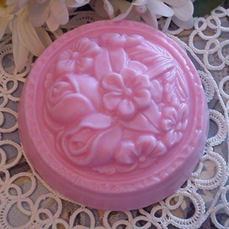 The bar is colored a carnation pink and is scented with Hawaiian hibiscus fragrance oil. 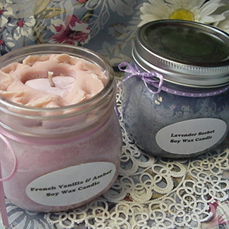 Hawaiian hibiscus is a delightful fresh floral bouquet of Hawaiian hibiscus infused with sprigs of lavender and sweet violets that is then *kissed* softly by sunlit green citrus notes. Loofah is a climbing vine with fruits that look like cucumbers. The young fruit is edible and is sometimes called Chinese okra, but when left to dry on the vine, the skin of the fruit becomes the product referred to as a loofah sponge. Loofah is a wonderful exfoliating sponge that gently removes the surface layer of dead skin cells leaving skin looking radiant, healthy and smooth. Exfoliation enhances circulation, removes calluses and helps to prevent ingrown hairs on the face and body. 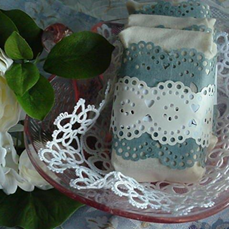 With proper care, each Loofah soap should give you one month of luxurious, rejuvenating washes. Do not immerse soap in water except while using it. Do not set soap where water will run on it and do not leave soap sitting in water.